Monkey Forest in the southern Ubud, the end of Jalan Monkey Forest is the nature preserve, and wild monkeys walk freely in the forest. This forest is the grove of the village shrine to protect Pura (Hindu temple). 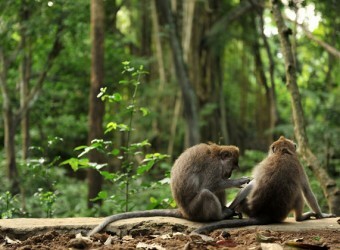 Monkeys, the living creature in the forest are protected by village people as the sacred animal. People protect monkeys, monkeys protect the forest, and the forest protects Pura.